Japanese merchants have an efficient way of getting rid of odds and ends of merchandise at the beginning the new year – and it would be great if it caught on here. 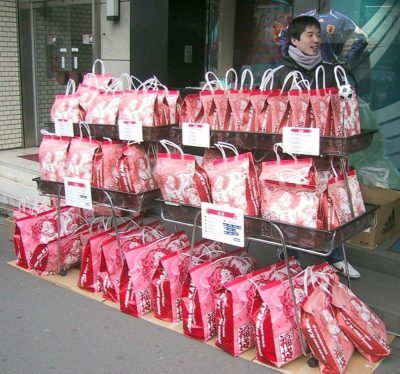 A fukubukuro, or lucky bag, is a grab bag filled with merchandise with a value of at least twice what the customer pays. The bags range from those filled with small items to bags containing vouchers for large appliances. The tradition is not a new one – it originated around 1900 with the Ginza Matsuya Department Store. Over the years it has gained momentum, and has spread to some other countries and even the state of Hawaii. The excitement of opening a grab bag is perfect for sharing on social media, so the popularity of the fukubukuro is growing. According to an article on BBC’s website, thousands of people now line up for hours to get their mystery goodie bag. There are of course a limited number of bags sold, and they are all worth more than the price paid. Each bag is usually themed, so the consumer has an idea whether they are getting housewares or toys. Some stores add to the excitement by putting high value items such as vouchers for plane tickets or fur coats in a few of the bags, adding an element of gambling to the purchase of a fukubukuro. Consumers often post social media pictures of the contents of their bags, sometimes offering to trade if they got something they can’t use. There are two ways to participate in this idea – one is to offer a great buy on mostly desirable merchandise that you are discontinuing, or even want to promote through the excitement of a “lucky bag.” The other is to use this as an opportunity to get rid of odds and ends at a very low price. These bags are apparently sometimes referred to as “misfortune” or “depressing” bags – even though they’re still a bargain. It’s too late to start the year with a fukubukuro event, but why not consider adding a “lucky bag” promotion to your store’s calendar of events? You could shop closeouts for the contents of some of the bags, and use others to move clearance merchandise out of the store. Just make sure that customers feel that their purchase is a sign of good fortune, and makes them want to tell their friends about the fun of shopping at your store. PS I will be presenting two free seminars during the upcoming Las Vegas Market, and would love to see you there! 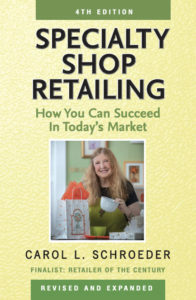 Each one will be followed by a book signing for the new edition of Specialty Shop Retailing.